I hope this helps you in starting with the art/hobby that you like so much, but feel intimidated – “what if I try and I don’t like what I can do?”. Starting with a test of tools and techniques, or just some free doodling, is a good way to break the “white canvas fear” and give you courage to practice further. I have not posted any more doodles in the last two weeks, as I felt that the streak had came to an end. I had more and more trouble finding subjects for my doodles, delayed them until bedtime, and did not experiment with techniques anymore. The daily doodle had became a chore, instead of a positive exercise. It’s time to find another routine. I have then thought about which activities bring me joy and let me improve my skills. There are not many in my planning, that is nevertheless full: most of what I do is walking on known paths. How can I reach the appropriate ratio of known to new? The known. Upon own reflection and some hints from Moshé Feldenkrais’ method, I realised that the mere repetition of a movement or a routine does not automatically bring improvement. The real step forward is guided by awareness of what is being done, that gives the ability to evaluate changements in the practice. I struggle with that quite often, just like a wanderer feels he’s walking in circles in a wood, unable to know if he is making progress in any direction. So, after a long time “just practising”, I feel that I need meaningful feedback on what I draw and play. As I am not good enough a judge for myself, I think I need someone with a better trained eye and the ability to filter and reorder the list of what I need to improve. When I do that myself, I usually notice a pile of things to work on, feel overwhelmed and delay/quit, or start with the most apparent but the most difficult hurdle with little success. I am able to give myself feedback, but on things I know really well, so I don’t find myself able to be my own guide on uncharted land. The new. It is not enough for me to go through the usual exercises every day, but I find it very difficult to just pick up something new and try to do it. The biggest blocker for me is not knowing if I am doing the new thing right, or at least, in a way that I can improve without needing to unlearn it first. This is again a feedback issue: I need more experienced eyes than mine to guide me around new topics. I have had the chance so far to find great guides in their domains, who showed me their way. I walked with them and enjoyed learning completely new skills, not much for a genuine love for those topics, but rather for the way they were presented. For all these things I benefit so much from my drum lessons: I enjoy the balance of challenges, strenghtening of known routines, and simple enjoyment of a well-played sequence, that my teacher builds up for me. I bask in the gentle attention to all my movements, and the measured feedback – measured on what I am able to realise and improve in that moment. I have never understood how someone could approach new activities by “just try doing them, you’ll get better on the way”. I used to see that as immensely arrogant and self-sufficient, especially when it was proposed as the main way to learn. There are however a few activities that I can improve on my own feedback only, and a few more if I content myself with slow/random improvement or minimal goals. For faster pace and higher targets, I need additional external advice. When I said that, some people thought I meant that I needed to trust that external feedback – but it is not a blind trust, it is more an acceptance of informed hints. I have left teachers and schools when I realised we didn’t match, and we both experienced frustration, and felt that our energy was more dissipated than transformed. There is also a difference between learning how to do an activity that involves only objects, and one that involves sentient beings (animals and people). With objects only, you can make huge progress by learning from others, because the steps are reproducible and the progress is measurable, and you are the only variable element. With animals and people, it’s another story. Your situation is unique: the combination of minds can be understood only by who is in it, decisions can be taken only by the involved parties. External advice can be immensely useful, but never binding. I re-read Lynne Gerald’s post about expert advice, and found it so spot on. Ha! Lots of reflections came out of my doodling crisis. Hope they help clarify other unclear corners and let me start afresh. And help you readers as much as you help me by sharing your thoughts online, that’s why I write here. Today I lead a reflection about hippos. When I think about these huge animals, I visualise them when they walk around on the ground, feeding, trotting on their short legs, their big, round bodies wobbling gently around. They are commonly seen as clumsy, ugly, inelegant and even ridiculous. I drew one, trying to render its mass, its roundness, its disproportions, its sheer force. When hippos enter water, they transform. Water is able to support their bodies so that the small legs don’t bend anymore under the weight, and become small flippers. Their round bellies appear even rounder, and are gently kneaded by waves as if they were grey, breathing bread dough. Swimming hippos appear more like whales. I imagine how a hippo could find time and fun just playing in water, swirling around, enjoying these moments and bubbling from his big nostrils. Day 71 I was feeling tired, but overall good, so I opted for a relaxed, somewhat tired sun. Day 74 was hatching day and I drew a horse, with the direction of hatches following muscles and overall body shapes. The right part of the drawing is not so accurate, but I lost patience at some point. Day 75 I scribbled with a ballpoint pen, using my coat as subject. The result is not so impressive still. Day 76 is a simple horse coloured with felt pens. To make it a bit challenging I tried an unusual perspective, and I am quite happy for it! Day 77 is a sole fish. We ate a lot of fish that day, including very delicate and tasty soles. Tenth week already! This week I focused on textures and different pens. On day 64 I drew a bread loaf with a ballpoint pen. I tried to render the crumbliness of the crust by a squiggly line instead of my usual hatches. I think it is a step forward, even if the overall shadowing is quite inconsistent and does not really make it look like a bread loaf. Day 65 I drew water. 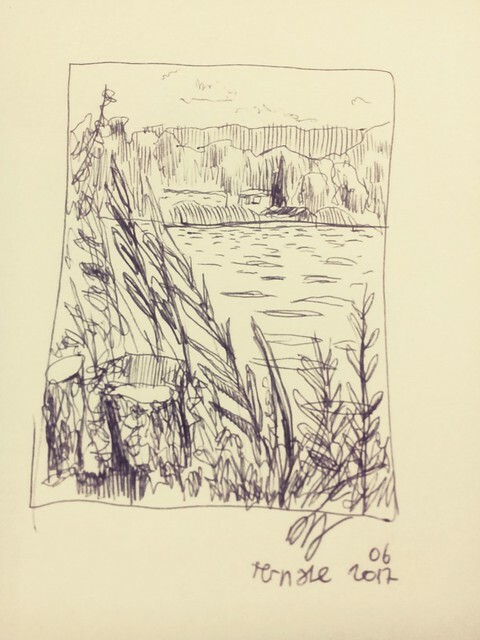 I chose to copy the picture of a calm lake with my favourite black gel pen. I paid attention to the short lines made by the reflections in the distance, and tried to render the long lines of the gentle waves next to the shore. I am quite happy with the result, even if the lower part of the picture can be improved. Day 66 was fur day! I found the picture of a longhair cat and tried to copy the long fur of its neck. I found it quite difficult, because the first impulse would be to draw the hairs themselves, but by doing so I would put a dark line where there is light; drawing the shadows of hair tufts is a much slower, more reflective, brainy job. If I could draw with a light pencil on a dark background, that would be much simpler and intuitive. Day 67 is my attempt to draw a metallic object, namely a sauce boat (source: Wikipedia). The shadows and lights have very crisp edges and the pattern depends on the objects that are reflected on the surface. I don’t know if it looks good enough, first because I didn’t draw the whole object, second because the contrast in my drawing is not so strong (I could have made much darker areas). Day 68 is a view of Bologna. I attempted to follow John Muir Law’s suggestion to use a broader, darker line for the foreground and a thinner line for the background, as well as stronger vs. lighter contrasts. It looks promising to me. Day 69 I drew two does. They are next to each other, but don’t look in the same direction. I have since a long time the idea to draw something like this, to represent how two people can be close and still have the freedom to orient their attention where they want, not necessarily on the same things. I had this feeling with people I felt very close with. We could be in the same room and be busy with different activities, and still be connected. Day 70 is the very early phase of an assignment that I got last Saturday for my Montessori diploma. We are now going through language materials, and one of them is a set of cards with an object and its name written below, and a corresponding set of cards with the same objects, but with the name written on a separate piece of paper. The task is to recognise the objects, read the name and match all names to the pictures. The cards with both object and name are used as control. Each of the course participants has to choose a category of objects for which he/she will produce a set of 15 cards. I chose dinosaurs, and this is my start. See past weeks here: week 1 – week 2 – week 3 – week 4 – week 5 – week 6 – week 7 – week 8 – week 9. This week I really had trouble finding ideas for my daily doodles. Most ideas that came to my mind would take too long to be done properly, and would require a bigger paper size. Therefore I decided to explore textures and unfamiliar techniques. Day 57 is the rendering of the forehead of a horse. You can guess the whirl of short hair in the middle, the darker hair at the sides and the curly forelock on the left. It is quickly done with only one pencil, so most contrast is missing and the result is not so clear. Day 59 is a drawing made with a single line with my favourite black gel pen. It represents the front legs of a wolf cub. I started with the outline of the leg on the left, did the fingers with claws, went up the leg, down the other, drew its fingers and claws, went up again, and decided to add some idea of shadows all around. Day 60 is the visualisation of Montessori’s binomial cube, a sensorial material that let preschool children experience mathematical concepts in form of a puzzle. Day 61 was just scribbling with all the pens I had in my house, after I read John Muir Law’s post about drawing with simple ballpoint pens. When you don’t have a pencil, or want to use all pages of your sketchbook without worrying that sketches will smear on each other, you can use a ballpoint pen that is capable of making lighter shades when you use less pressure. There are a few caveats but it’s totally worth giving it a try. Day 62 is a comeback of the minotaur! This time, instead of making a lame selfie or lying hopelessly in a mini-labirinth, he is studying. I like thinking of this minotaur as the part of myself that feels sometimes trapped, sometimes active and enthusiastic, but always sort of unusual. Day 63 is a long-due optional assignment for the NHI101x course. I tried to make a small preparatory study of a bird, that shows the main skeletal features. You have to know a bit of anatomy to guess where the wings are actually attached, because each species has a different amount of “arm” structure hidden in the muscles and feathers of the body. See you next week for the tenth summary!